The use of no-purge samplers, like the HydraSleeve, is arguably the fastest growing segment of the groundwater monitoring market. Tens of thousands of samples are collected each year using no-purge sampling devices. Why? It provides formation quality samples using a much simplified and repeatable groundwater sampling method, resulting in dramatically reduced field time and expense. In addition, it is a less energy intensive method of collecting groundwater samples, producing a smaller carbon footprint than conventional sampling methods. The following constitute the top three questions we get pertaining to the HydraSleeve. 1) HOW DO I SOLVE PROBLEMS WITH SAMPLE VOLUME USING A NO-PURGE SAMPLER? HOW DO I GET MORE VOLUME FROM MY NO-PURGE SAMPLER? By definition, no-purge sampling devices are restricted to collecting the volume of fluid contained within the well screen. For example, a 2-inch well with a 10-foot long saturated screen has an absolute maximum of 6.4 liters (1.6 gallons) of water available for no-purge sampling. In response to the sample volume issue, GeoInsight has developed a sampler which will collect the most water available from a 2-inch (schedule 40) well. This new device, developed in the summer of 2009, the HydraSleeve Super/SkinnySleeve (SS), has almost doubled the amount of water that could be collected out of a 2-inch well as compared with earlier designs of the HydraSleeve. Prior to the development of the HydraSleeve SS, only about 45% of the available water could be captured from the well screen. 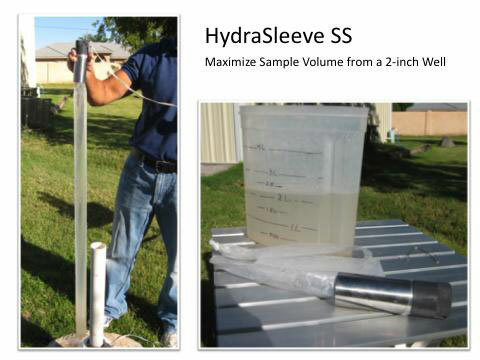 Using the HydraSleeve SS, up to 80% of the available water in the well screen can be collected as sample. This is very important for 2-inch wells with a short screened interval or a short water column within the screen. 2) WHAT DO THE REGULATORS THINK? When we first introduced the HydraSleeve, this was the most asked question. Now most regulators are familiar with no-purge sampling. HydraSleeve and Passive Diffusion Bags have been used in all 50 states, Canada and overseas. 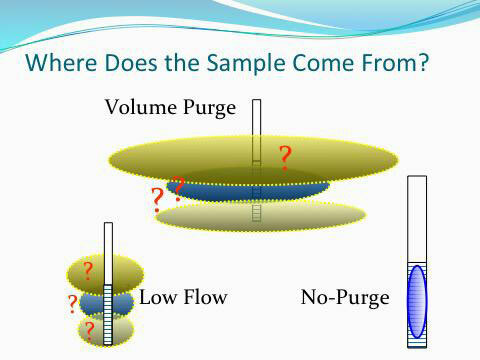 There are a few states that may recommend either well-volume purging or low-flow methods in their guidance, but they still do not exclude no-purge sampling. There are no states that specifically prohibit the use of any no-purge (passive) sampling technology. The regulatory approval climate is changing. The Kansas Department of Health and Environment (KDHE) has developed a "Sampling and Analysis Plan Development for Industrial Landfills "technical guidance document", which discusses the proper use of the HydraSleeve no-purge sampler. Conversion to no-purge sampling methods is typically examined on a site-by-site basis. Usually this entails an initial round of no-purge sampling, the results of which are compared with the results from the site's previous sampling method. The comparison of data from the two methods is used to determine if no-purge sampling meets the site's data quality objectives. 3) WHY DON'T MY RESULTS COMPARE IN ALL THE WELLS? In the majority of wells, results from samples collected with the HydraSleeve (as well as other no-purge samplers) will compare favorably with results from samples collected with traditional sampling methods (i.e. well-volume purging and low-flow purging). Some samples may have slightly higher concentrations and some slightly lower concentrations. However, in a few wells, some samples may not compare very well at all. In almost all of these cases, this is due to the inherent differences between low-flow sampling, well-volume purging and no-purge sampling and the resulting source of the sampled water. 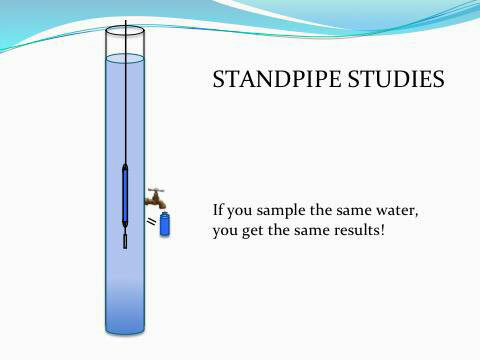 Standpipe studies conducted by Parker and others in 2002 demonstrated that no-purge samplers (HydraSleeve included) produced statistically similar results in a spiked standpipe when compared to results from samples collected from a discharge spigot at the same depth. Similar investigations done at the Stennis Space Center under the EPA Environmental Technology Verification Program compared low-flow pumping systems and no-purge sampling devices to control samples collected in a 100-foot long standpipe. Again, the results compared favorably with the control samples. In short, if you sample the same water you get the same results. Beginning January 1st we launched a new, modern, look to our website. We are excited to introduce our brand new website design, please click here and browse around - see how you like it. Simple by Design as we say! All of the information is available - we just put it in a brighter, mobile-friendly, user-friendly layout. If you are already registered to purchase HydraSleeves online, your user ID and password remain the same. Everything transferred to the new website without disrupting any databases already in place. During the next few months we will be updating some articles and reviewing important information through these newsletters to keep you up to date on our products and policies. Please see the new HydraSleeve selection chart by clicking here. The updated weight selection chart and 2019 terms of service are included below. 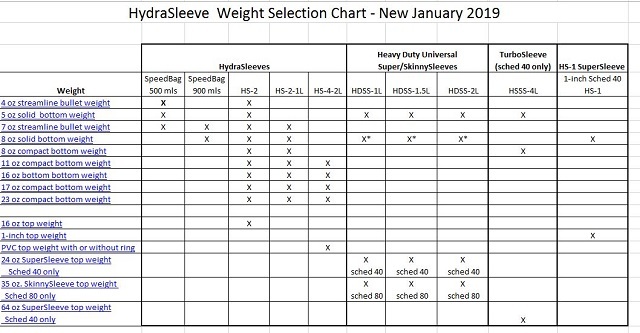 To see which weights are compatible with which HydraSleeves, please see the chart below. To download or view the pdf file, please click the image. A 5-ounce bottom weight must be used in conjunction with any top weight. When using armored HydraSleeves, please choose at least 1 level heavier than the minimum bottom weight. Please call or email for weight recommendations when using two or more HydraSleeves on one tether. Customer satisfaction is our goal. Although we must adhere to the refund policies listed below, we also want to know of any problems or issues you may have. Please call 800-996-2225 to discuss any problems with a GeoInsight representative. In the unlikely event that our products are found to be defective in material or workmanship, we will issue a full 100% refund or replacement including all shipping charges. Due to the fact that our products are used in potentially hazardous environments, we do not accept returns (other than for defective material as described above) on any items that cannot be decontaminated. This includes, but is not limited to, HydraSleeves and tether. Once the items leave our facility we have no control in their handling after the package is opened. If you decide you do not want the items ordered, please refuse delivery from the carrier and do not allow the carrier to open the package. A full refund for the materials, excluding outgoing & incoming shipping charges, will be issued within 5 days (after receipt of return) for unopened, refused packages. Customer must NOT accept delivery to obtain this refund. Items which can be decontaminated, such as weights and clips made of stainless steel, can be returned for a partial refund. A restocking fee of 30% will be imposed on returned items of this nature. The return must be pre-approved by a GeoInsight employee and the customer must obtain a return authorization number prior to making the return. Customer must pay the cost to ship the returned items back to our facility in Las Cruces, New Mexico. Please call 800-996-2225 to discuss your situation, and to obtain a return number if a refund is requested. 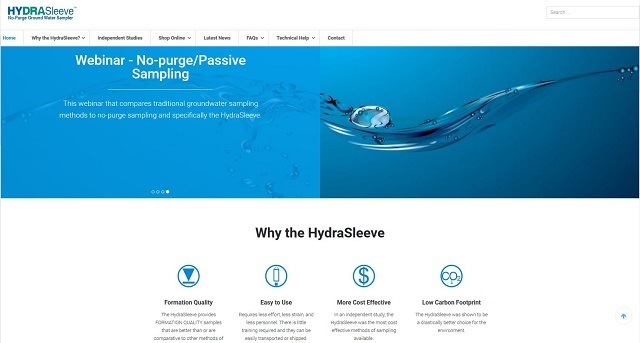 HydraSleeve is committed to offering our customers a safe, reliable, and secure web presence, we will not share your information with any other parties. Typically orders of items in stock will be shipped within 2 business days. All cartons are insured for the value of the products; any claim for lost or damaged items must be made with the carrier. We warrant that our products are free from defects in material and workmanship under normal use and service as described in our field manuals. As described above, a full refund will be issued within 1 year from the date of purchase provided the materials are used in accordance with written manuals and/or other instructions. Claims for defective products must be approved by a GeoInsight employee and may include physical inspection of the defective materials. This guarantee is null and void on any part which has been subject to alteration, accident, abuse or misuse. The guarantee is valid only to the original using purchaser and is limited to the original purchase price only.